Stave churches, or stavkyrkje, are a style of medieval timber frame church. 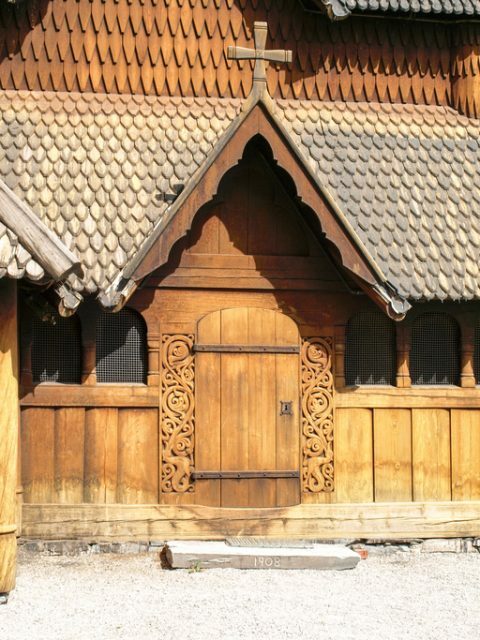 The post-and-lintel architecture, which is unique to Scandinavia, developed from traditional Viking construction methods. 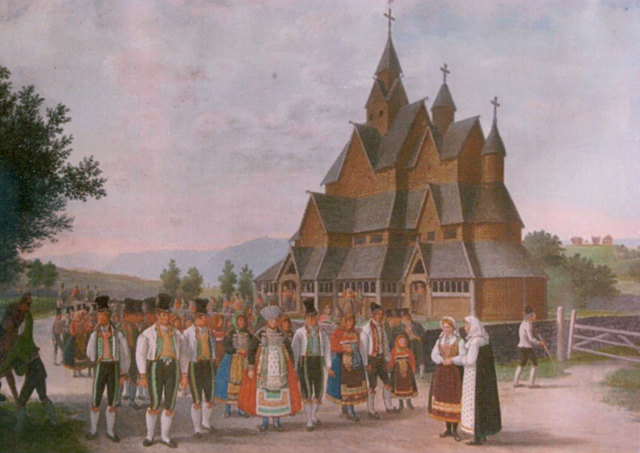 It is estimated there were once between 1,200 and 2,000 of these beautifully crafted churches in Norway. 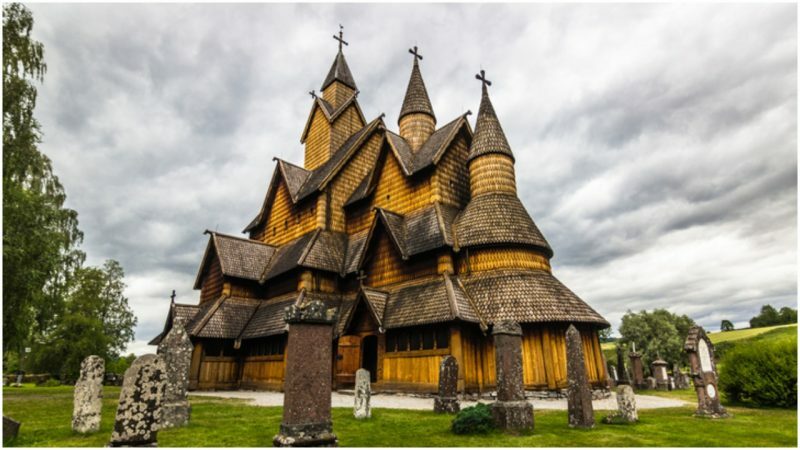 Today only 28 remain and the largest of these is the 800-years-old Heddal stave church. Not only does it look like something straight from the pages of a fairytale book, according to local folklore, it was built in just three days with the help of a fearsome troll. 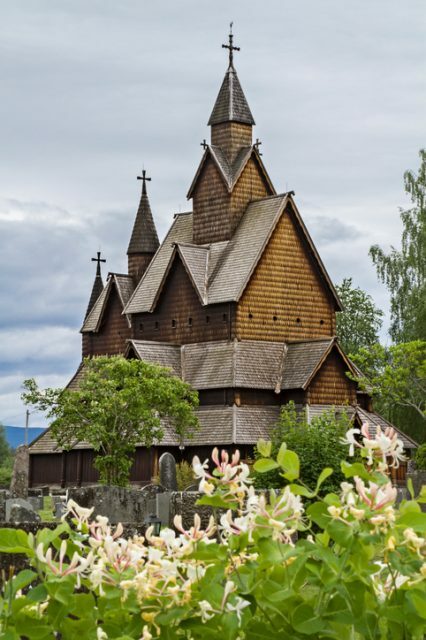 Front view of the Stave Church of Heddal, Norway. 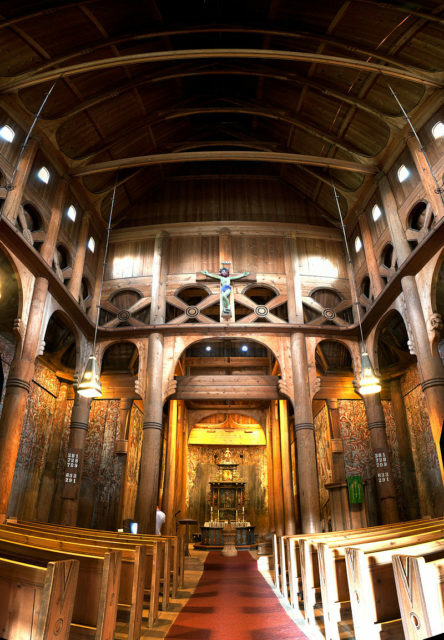 As Christianity spread throughout Norway in the Middle Ages, the Viking craftsmen applied their boat-building skills to creating grand churches. Stavkirche Heddal by Johannes Flintoe, 1828. Heddal Stavkyrkje was based around an older, smaller church, parts of which are still evident in the chancel. Most of church we see today was built in the early-1200s, during the reign of king Håkon Håkonsson, also known as Haakon the Old, although it has been expanded and remodelled several times. The Christian king Haakon encouraged the construction of new churches and discouraged the old, pagan ways. Like many of the churches built during this period, however, symbols and themes of the old mythology were incorporated into Heddal church. Entrance to the Heddal Stave Church near Notodden in Norway. 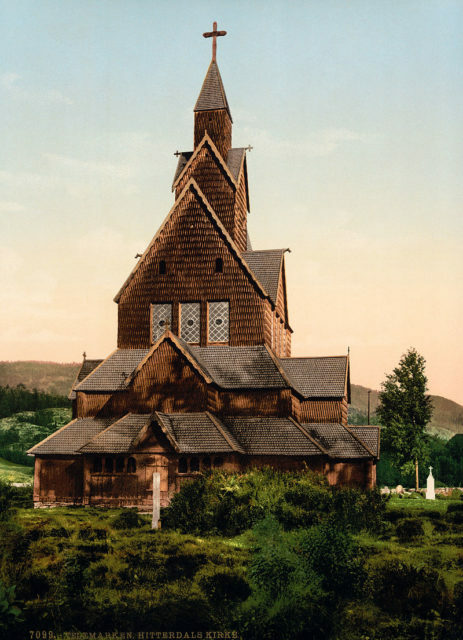 Heddal stave church, sometime between 1890 and 1900. Heddal church has three towers and a multi-tiered roof that consists of 64 separate roof surfaces. The church’s exterior has many runic inscriptions that are interpreted to be decorations as well as insignia of long ago. The main entrance of the church is through the West Portal. The portals are embellished with carvings that depict animal motifs, while the interior pillars of the nave are topped with carved stylized masks. Much of the interior décor dates from after the Lutheran Reformation of the 16th century. Of particular note from this period is the rosemaling, or “rose painting”, that covers the walls in ornate tendrils of blue, green, and ochre. The chancel also has a row of paintings of the apostles John, Matthew, Thomas, Peter, and Andrew. The altarpiece dates from 1667 and presents sculpted allegorical depictions of Christian motifs. It was restored in 1908. In 1939, the church was restored to its medieval appearance through the work of the architects Gudolf Blakstad and Herman Munthe-Kaas. 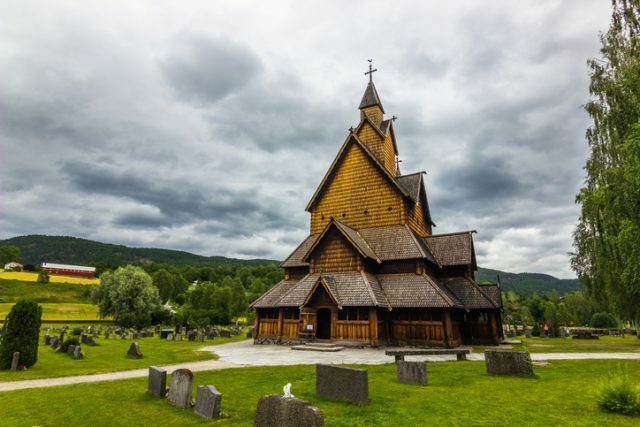 Heddal Stavekirke is Norway’s biggest Stave Church. It was built in the 12th/13th century and houses a cemetery for the nearby town. This church is an even more intriguing place once one hears the legend of its origin. The story goes that five farmers from Heddal named Raud Rygi, Stebbe Strånd, Kjeik Sem, Grut Grene, and Vrang Stivi decided to join forces and build a church for the town. Heddal Stave Church in Norway. Raud Rygi was chosen to oversee the construction work. As he stood at the chosen site, worrying if he was up to the task, Raud was approached by a stranger who offered to help. In fact, the stranger went on, he could build their church in just three days — but he demanded an unusual fee. The conditions of payment were that Raud was to bring either the sun or the moon from the sky, or to guess the stranger’s name. And if he could do none of these, then the stranger would cut out Raud’s heart and take that in payment instead. Raud thought it would be easy to find out the man’s name so he accepted the challenge. After all, how could one man possibly build a church in three days, anyway? 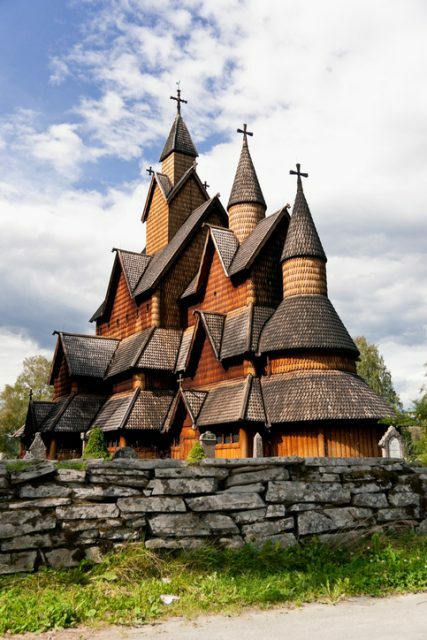 Stave Church Heddal is around 85 feet (26 meters) high, the largest of its kind in Norway. However, on the first night the stranger managed to bring all the stone and timber that would be needed. By the end of the second night the frame was complete and poor Raud was getting worried about the deal he had struck. He was a man of his word, and it seemed that he surely would have to forfeit his life for the sake of the church. On the third day Raud was no closer to finding out the stranger’s name so he walked the fields, thinking up every name he could. The answer to the riddle was clear — the stranger was Finn Fagerlokk (or Finn Finehair) a mountain troll who lived inside Svintråberget. The troll Finn Finehair is also the pivotal character in other Nordic legends, such as the building of Trondheim Cathedral, also in Norway, and Lund Cathedral in Sweden. 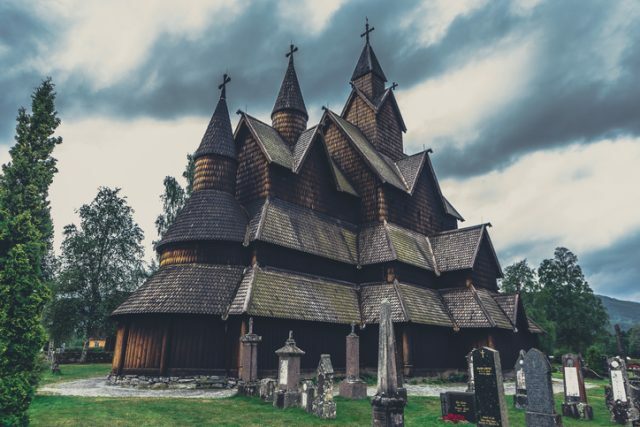 Regular services are still held at Heddal stave church, and tours are available at other times in either Norwegian or English. Café Olea, stationed in the vicarage barn, and an open-air museum can be found close by.